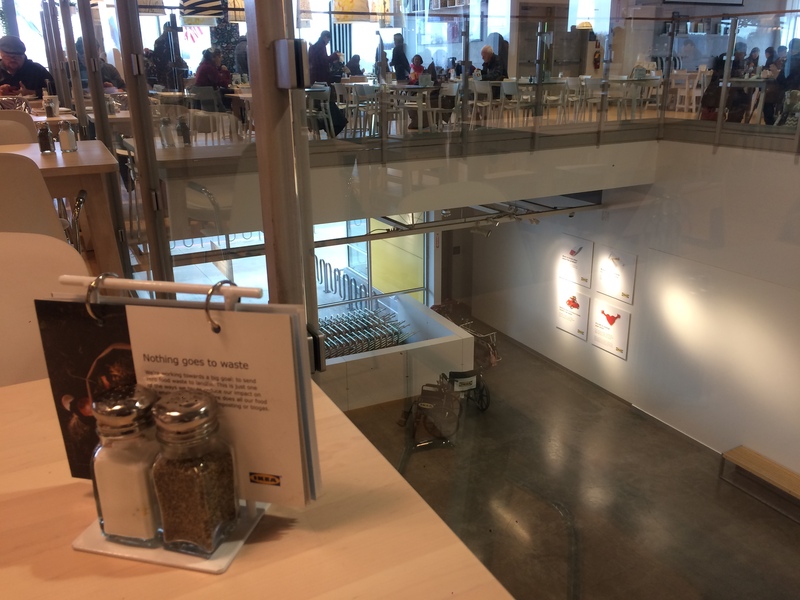 Two months after my inaugural trip to Portland IKEA by Bike on the I-205 Multi-Use Path I made a second visit. This time I didn’t get lost off the I-205 Path at Glisan, but I still think it needs one more sign. 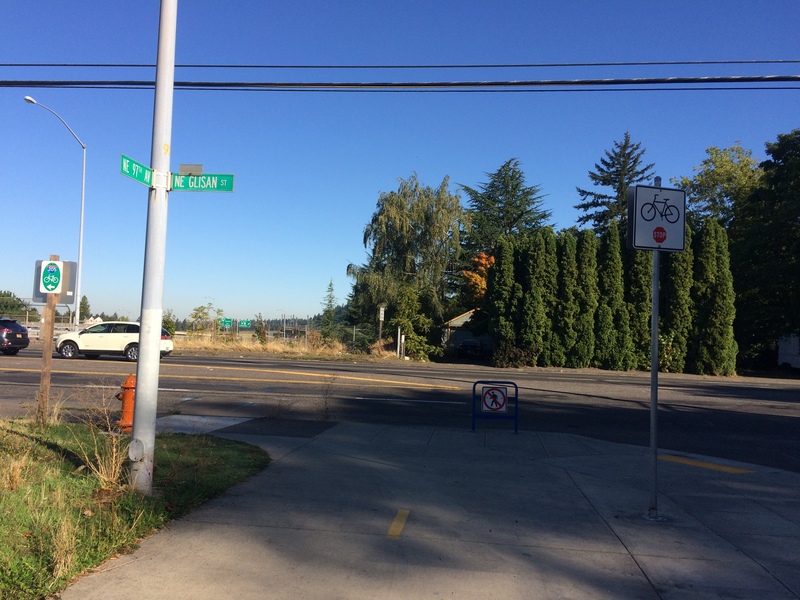 Below is my photo I took and shared last time: the bike arrow on the left is accurate, but there should be a second arrow indicating to use the crosswalk immediately beyond this sign. I think there probably used to be one. It wouldn’t be such a big deal if it was easy to recognize the trail across the street, but it’s tucked next to the freeway and winds out of view quickly so it’s hard to spot from afar. I also paid attention to the Burnside crossing over the freeway and noticed that while there is indeed a paint-buffered bike lane in the street (I noticed this after the fact in Google street view last time), there’s no curb cut to get down to the street from where the trail surfaces. One could wiggle a little bit out of the way to the left to find a curb cut and make a sharp turn into the busy street so it’s just easier to stay up on the sidewalk. FUN STUFF! 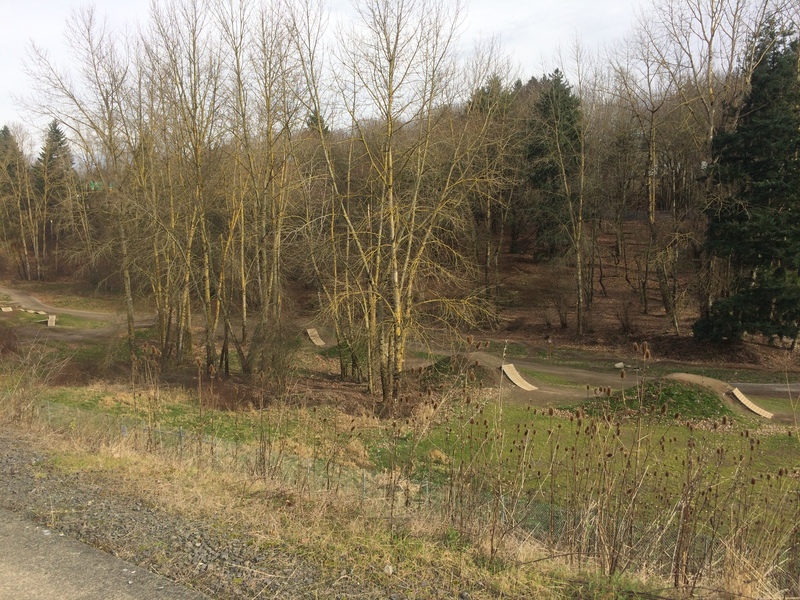 New this time: I cut through the Gateway Green mountain bike park which is alongside the trail. 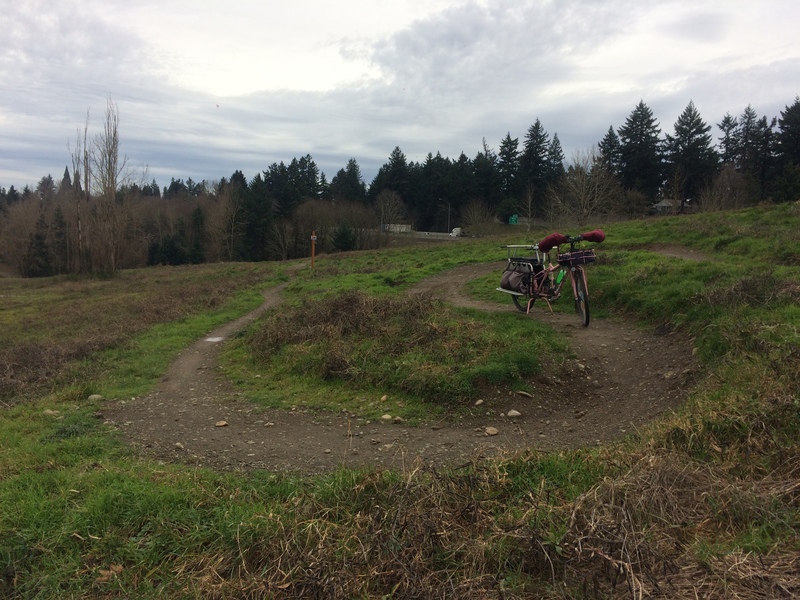 It’s easy to see (and shudder at) the jumps while biking by, but I was happy to discover a whole network of single track! Blog post about that coming soon. 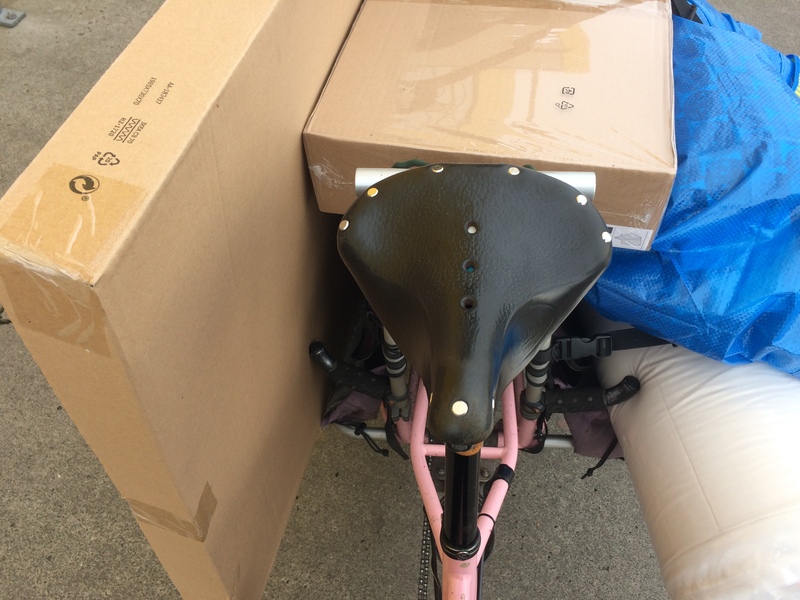 I have friends who shop with their cargo bikes in big home improvement stores, using them as shopping carts, but this is the first time I’ve had my bike inside a store. I have to say it was really nice to have it tucked fairly out of sight while slowly and clumsily wrestling my items on versus at the bike rack by the entrance on full display. 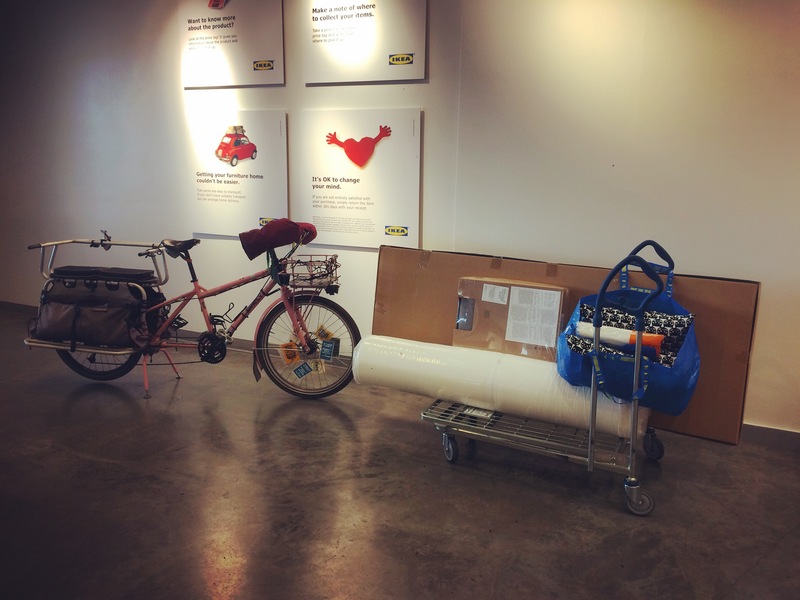 Especially so this time, when the size of my load caught me off guard (but I’m always a slow and clumsy bike loader). Which brings me to the real topic of this post: LONG LOADS. 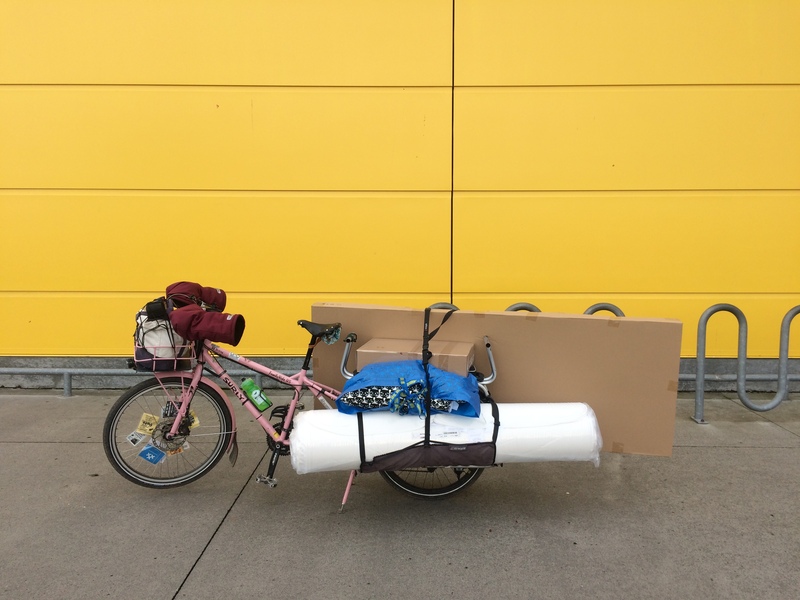 Now I know and won’t make this mistake again, but before this trip’s rude awakening I only paid attention to the weight of IKEA packages online when deciding if a thing is bikeable. As long as it doesn’t weigh much more than the kids (~140 pounds together) I deem it carryable. This trip was to get a sofa sleeper: 63 pound bed frame and 29 pound mattress. 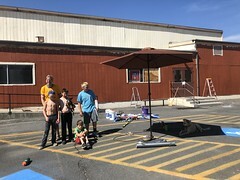 Totally lighter than the kids! Even if I had looked at the dimensions (30 x 3 x 79 inches and 58 x 12 inches) I don’t know if it would have given me pause. They’re just random numbers when you have no basis for comparison, after all. Small and heavy (like the bookcases on my first trip) is manageable, but big and heavy is another story. I was much too stubborn to give up my task when I found my way to aisle 32, bin 02 and discovered the size of this thing. 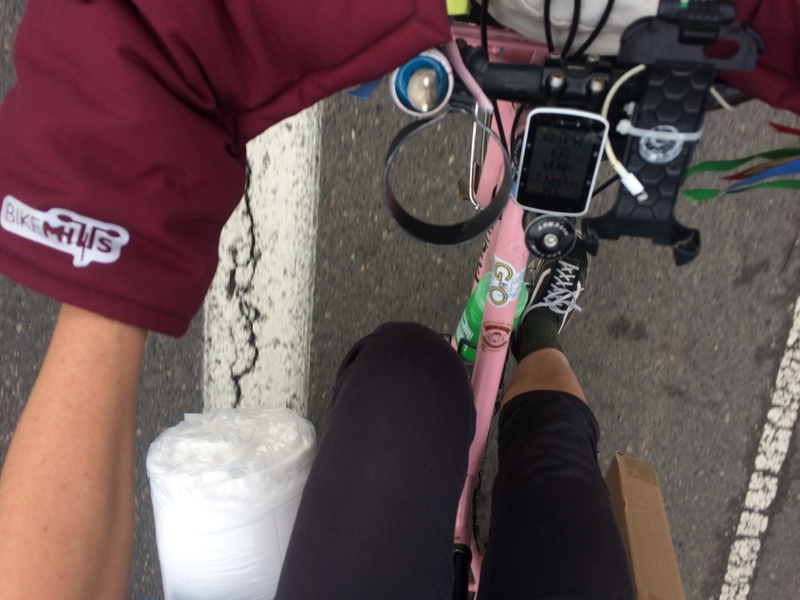 It was hard to get onto my shopping cart, but that didn’t get me too worried–pedaling a bike with heavy stuff on it is much easier than loading said heavy stuff onto the bike or shopping cart. I’ve carried things a little bit longer than my FlightDeck (the flat thing the kids sit on) before, but never anything so much longer that more of it would hang off the back than rest in the bags. I discovered this is simply too long and heavy to attach and pulls the bike down backwards. Of course my first thought was, “I need to put something really heavy in the front basket to balance it out!” but I’m pretty sure that wouldn’t have done the trick (though it probably would have helped with loading so next time I’ll borrow something small and heavy if I remember). I should add that my centerstand, the Rolling Jackass, plays a big part in my being able to carry loads like this. I’m not particularly strong so being able to clumsily load uneven cargo, knowing the RJ will keep the bike upright, is very important. Here’s my Strava of the ride so you can see how nice and flat it is. 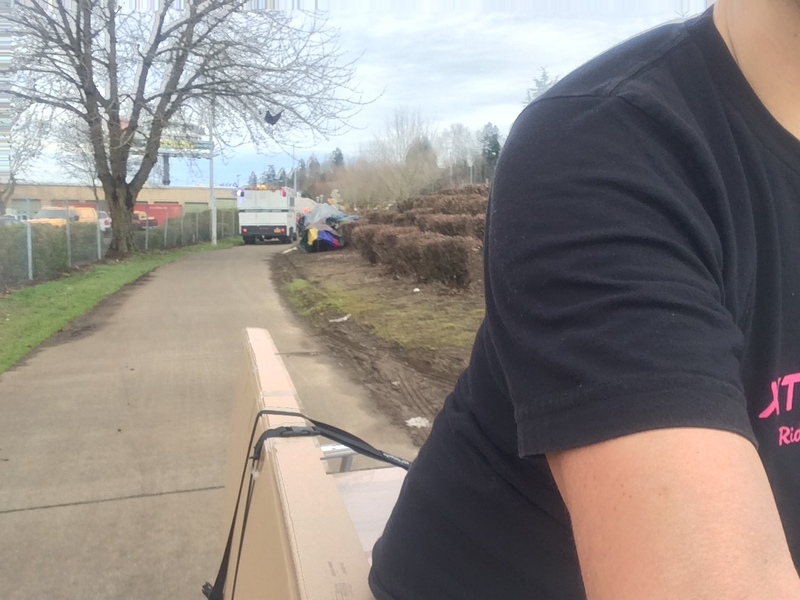 Granted, there was a work truck with a cleaning crew blocking the trail at one point and I nearly wasn’t able to walk my bike through the grass around it, but the pedaling part was all terrific! My next visit will be on a nice-weather weekend day with the kids. It’ll be a long ride for them, but I think it will be a perfect all-day excursion with lunch in the middle, mountain biking halfway there in both directions, and hopefully the perfect doggie window perch/bed as a result. Yes, send me a picture, that sounds awesome! Cargo trailers are pretty terrific for carrying bulky loads.